Tamer Union: Digimon Linkz Is "In Development"
December 28th, 2015. The official @Digimon_game account tweeted that the upcoming smartphone game Digimon Linkz is "in development," asking fans to look forward to the game while its team makes improvements. Bandai also shared two screenshots from Linkz in the meantime. 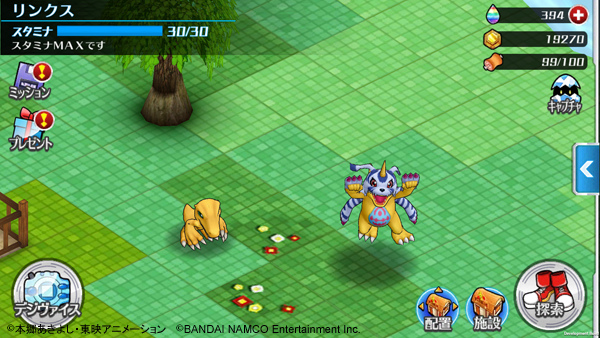 The images show a maxed-out Stamina bar, icons for Missions, Presents, a Digivice, options to Configure items in the DigiGarden, a Farm Goods option, and a Capture feature to acquire new Digimon. 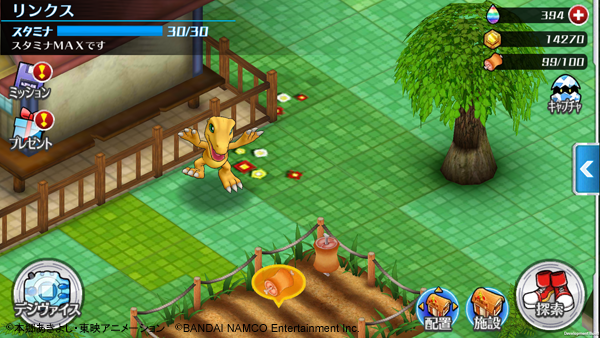 In the second screenshot, fans can also make out one of Digimon's traditional meat farms. Digimon Linkz has had a troubled production since its first announcement, having its launch date delayed from 2015 to 2016, and very little concrete information about it is known. Most recently, the game introduced its navigator character Kurihara Hina to issue an apology for the delays. Nonetheless, the game has proved popular even in lieu of a release date, with over fifty thousand people having preregistered for the game as of last November. Linkz will launch in 2016 on Android and iOS. The game will be free-to-play, with microtransactions. Watch the trailer here. I've just done my registration and it was surprisingly easy :) (taking into account of course that I don't understand Japanese xd). It'll really cool if the account system allowed you to communicate with your copy of digimon wolrd next order. Will the be a US version ? Awsome! i found this link through the review of grabmyessay.com writing service a while ago. I have done registering but still waiting for my account to be live. Im very excited about this. Thank you for the post!